This post is part of a series of profiles on performance and performance makers from the book Contemporary Performance Almanac 2013, an overview of contemporary performance presented during the 2012/2013 season available for touring now. 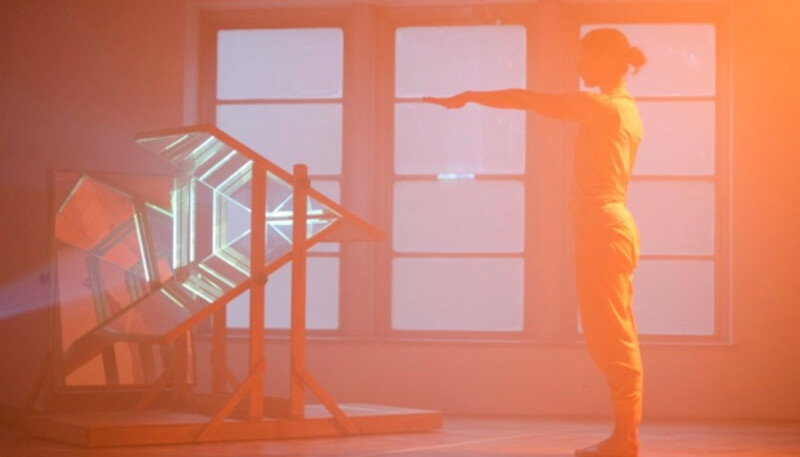 TWINSHIPS is one result of a six-month Housemate residency at Dancehouse. Over a period of six-months, I proposed a program for working that included others. My intention was to find and develop a practice and have others involved in that. So, I set up something called, ‘Groups:Meetings’ which operated alongside my solo time in the studio. During ‘Groups:Meetings’ I would show others a little of what I had been working on. What came from those moments of showing something and the discussion that followed has influenced TWINSHIPS. TWINSHIPS became an attempt to create two simultaneous worlds, the sonic and the physical, in order to challenge the way we observe and perceive people. A jewel-like reflective centerpiece that projects images of botanical and architectural landscapes is both set and metaphor. As Butterworth dances her solo, she manipulates the mirrored psyche of the Twinships’ worlds to expose notions of perception, truth and misrepresentation. For the second incarnation I worked with the same collaborators to find something else within the work, to revisit what I thought I liked and disliked in order to understand if these things had changed since the first presentation. I had originally set out to make huge changes, and to somehow present and reveal the apparatus used in creating a performance work for a gallery setting. I wanted it to be messy. I was unsure about repetition and time. It became two simultaneous projects, an attempt at refinement and a layering of image. Interloping majors. Bounce bounce, kick kick, spin. Stop. Wander. Light. Black grind. Born 1973, Deanne has been working in contemporary dance, since 1994 performing in Australia and abroad. She has a fascination with the simplicity of the moving body in space, how we choose to watch a performance and what we bring to it. Since 2006 she has concentrated on creating a body of mostly solo work and since 2009 has collaborated with sound artist Michael Munson. Forcefully changing the performance space through a range of sounds; the delicacy of ‘almost silence’ to wild thundering repetitive moments, she is also very interested in changing the setting of the space in which she performs. In 2012 she has begun collaborating with artist Linda Tegg on live site-specific performances. A long time performer in the work of Shelley Lasica, she has also performed with other renowned choreographers: Sandra Parker, Jo Lloyd, performed in the work of prominent visual artists and created collaborative works with other dancers. Her work has been presented at Dancehouse, Critical Path, Lucy Guerin Inc and in Dance Massive and she has been nominated for Green Room Awards. Deanne has undertaken residencies at Bundanon, Dancehouse and at PAF, France.